You know that saying … it takes a village to raise a child … believe me when I say, it took a village to create these reindeer! 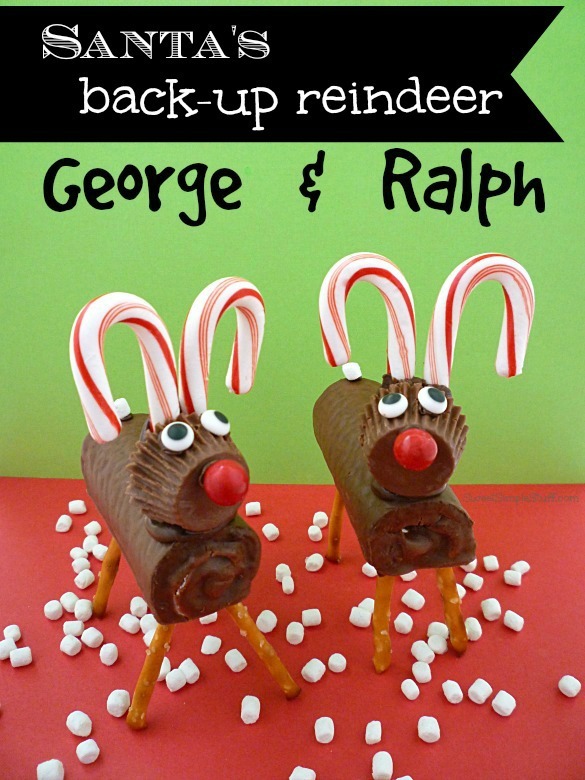 Here’s the story … I was browsing Pinterest and saw these cute chenille stem reindeer and thought that someday I should make something similar, using some sort of candy. Then Trish over at Sweetology 101 made these HoHo Reindeer and a light bulb went off in my head! I found four Swiss Rolls in my freezer … shocked that someone else didn’t eat them … went to work. I finished, but wasn’t totally happy with the reindeer … sent photos to friends and asked “Dorky or not?” … friends were kind and said “cute” … I wanted to believe them. Photos were taken and edited … went to bed … woke up at 5am and knew what was wrong … the peanut butter cups were backwards!!! I made new reindeer … took new photos and laughed at myself … laughed at the reindeer too! George and Ralph are living happily on my kitchen counter. I couldn’t ask for better pets! Santa may have eight tiny reindeer … we just have two, the back-up reindeer … George and Ralph … until somebody eats them! Work on a tray lined with wax paper or parchment. 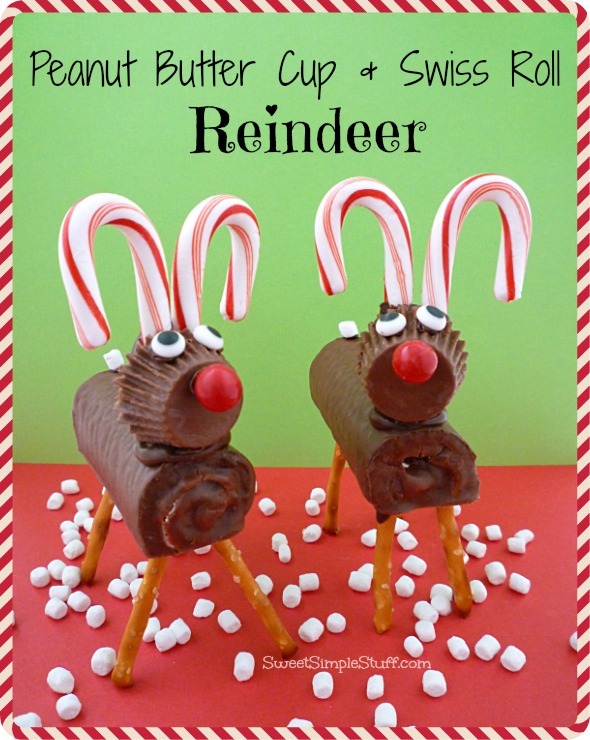 Give the reindeer four legs – turn a Swiss Roll bottom side up, dip the end of pretzel sticks in melted candy and insert into Swiss roll about 1/2″ to 3/4″ Make sure that all four pretzels are equal in length after they are inserted in the Swiss Rolls to ensure that the reindeer will stand up. 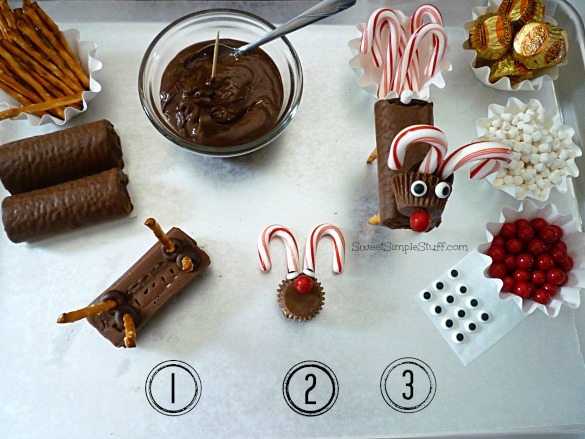 Dip the end (about 1/2″) of two mini candy canes in melted candy – lay the canes together (touching) on prepared tray to form antlers – immediately place a peanut butter cup (bottom side up) on the melted candy. Use melted candy to attach candy eyeballs and nose. Use melted candy to attach the head (hold until set) and tail. What will you name your reindeer? George and Ralph are cool additions to Santa’s team! Very cute! Great project for kids. Super cute! Love that Cindy’s Chenille Reindeer gave some inspiration! Pinned! Thank you Claire 🙂 You just never know where inspiration comes from … thank you to Cindy! I love these little guys! Very cute and tasty! I think I would add a Walter and Harry to the group. Thank you Sandy 🙂 If Walter and Harry joined the group, they could play in all the reindeer games! These are so adorable and absolutely love the names! They are so adorable! This would be a fun project to do with kids too! Thank you Alyssa 🙂 I’m sure that kids would have a great time … like art and craft time! Hi there! 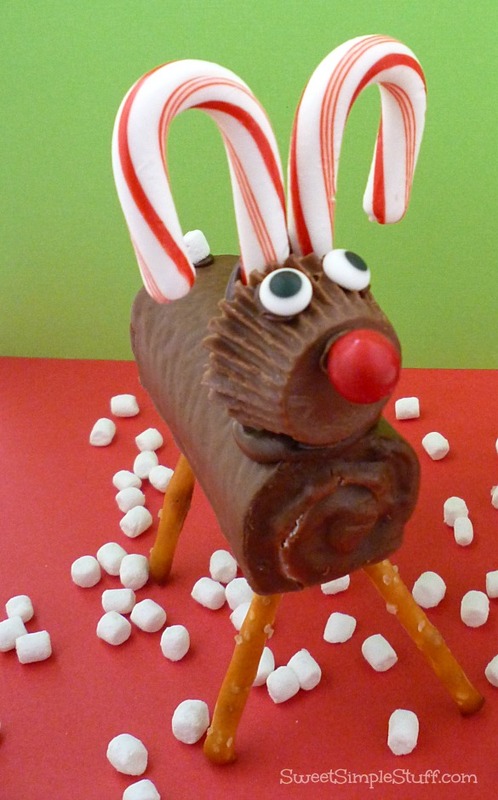 I LOVE your cute reindeer and I’d like to do it for my 4th grader’s class party – but we aren’t allowed to have peanut butter in the classroom – is there a substitute that you think would work? I would look for any chocolate candy about the same size, maybe even a mini muffin size brownie.